Who has the GM Console Vault or other brands for 2019’s. I wanted the wireless charging on my 2014 SLT and purchased a wireless charging pad from Amazon. It was a Choetech and still sells for about $20.00. Took apart the charging pad and the armrest and was able to install the pad under the recessed area in the arm rest. Drilled a small hole in the rear to get the wire down to the hinge area and then just plugged it into the usb port. Worked great. On my 2017 Denali the charging pad was intermittent but found on this website where someone had taken apart the arm rest and turned the charging pad 180 degrees which also turned the mat on the arm rest too. It worked great every time even the phone case. I don't know if this sort of mod would work with the 19 arm rest for those who do not have the built in charging pad. PSA if your swapping out your bowtie to a black one. The front camera on my 2019 Denali was not sealed properly and got water inside. Front view was real cloudy. The dealer verified and ordered a new one and set up an appointment to replace it. When I took it in to replace the camera, the tech had it back to me in about 35 minutes and it works perfect. He said he did not have to remove the grill but just leaned it forward to get his hand in. Don't understand the calibration issue but maybe ignorance is bliss. BTW, Hardman Buick GMC in Gainesville GA is a great dealer in all aspects. Factory GM spray in bedliner, just my thoughts on it. I have had Linex sprayed in four trucks by two different Linex dealers and none were sprayed under the bed rails. I had to go back over those four trucks with cleaner or clay bar to remove their primer/preparation spray from the paint, glass etc. My last two had the factory spray in liner and have not had any issues. Gun Safe for Center Console? The vault completely fills the storage area but, there is about 3 inches from the top of the vault to the top of the sides of the console. Rubber Maid makes some drawer dividers that will lock together that are 2 inches high that could sit on top of the vault if that works for you. I used a 6" by 9" in the bottom of the vault just for a little organization. I had this happen this morning on my truck. I was in a hurry so I gave it the go ahead and later I checked in the settings and found there was an infotainment update performed this morning. Everything was the same on all of my screens. Yup, two screws and a firm tug. It is easier to get the nuts in place and tighten them if you can unplug the wiring harness from the tail light once they are out of the body. Sierra Dan is correct. I have thought about the lower mileage due to the Fun Factor. I love hearing the exhaust note as the transmission is going thru the gears at about 1/3 throttle. As to what I paid for the truck, I went thru Costco which will get you supplier pricing but was able to do a little better. It is also nice to get the Costco $700 Cash Card. The accompanying letter said it was from GM. I don't really care who it came from but it makes the deal that much sweeter. I traded my 2017 Denali Ultimate for a 2019 Denali Ultimate in Dark Sky Metallic two months ago and am very pleased. Some people criticize this new model but I can honestly say that it is far superior to the previous design. It rides better, is quieter, smoother, more solid, and a lot quicker. My previous truck had the 6.2 engine as does this truck. The 10 speed trans is also smoother and when you give it a nudge there is no delay in downshifting. It really wants to run. Gas mileage seems to be about 1 to 1.5 mpg less than what I was able to get with the 2017 but will have to wait until we get the summer gas to be sure. The brakes are way better but I have noticed that there was a quick buildup of brake dust on the wheels so while it stops better the pads may not last as long. The Bridgestone Alenza tires seem to be quieter than the Michelin’s that I had on my 2017. One of the irritating things with the 2017 was the XM radio reception. Many have complained about it cutting out on some channels with no trees or buildings blocking the signal. This new truck has not cut out at all. There was also a complaint of the number of available XM channels which was a limit of the radio. The 2017 had about 150 channels. If I remember correctly. I checked the new truck and the available channels is 469. I really like the 360 degree camera. It’s very handy when parking. I like the keyless entry and the push button start stop. Its nice to unlock your truck and start it without having to take your keys out of your pocket. I have mixed emotions regarding the auto stop/start feature. It seems that the more it is driven the smoother the stop start is but maybe some of that is just me getting used to it. Bottom line is I really like this truck! I had an Access tonneau cover on my 2014 and moved it to my 2017 Sierra. When I was looking to buy my 2019 Sierra I saw the they had a different part number for their Lorado cover. The new cover works well with the pro tailgate but if it is adjusted too snug you have to give a little tug on the tailgate for it to drop. If it is a little too loose, you get a little water in. I am very pleased with the overall fit and quality of their Lorado cover . Thanks guys for the comments. I have tried to find the instructions for cutting them but so far had not found any. You guys are what makes this forum so great. BTW, this is a GREAT truck and I am very pleased with it. Ride, SiriusXM radio and everything else is much better than my 2017 Denali. Here is wishing you and yours the best Holiday Season ever. I purchased a 2019 Denali Ultimate with the all weather floor liners. My truck came with the smaller storage box under the rear seat and the dealer had installed the floor liners. This past weekend I needed to haul a larger box in the interior so I removed the storage box to find the dealer had hacked off about 9 inches of the floor liners. I called them and was told that they always do this but I have a meeting with them this Friday to hopefully replace these. Needless to say I am ticked that they would do this to a $200 option. Go to www.shopchevyparts.com and under cargo management they have what appears to be the same vault as lockerdown has. This is the same one that you can order from the factory and right now it is on sale for $187.50 and it comes with a combination lock. That price is about $100 less than Lockerdown. Another good option is to get the gun magnet from Lockerdown that you can attach to the inside of the vault so your handgun is in a vertical position and not laying on the bottom of the vault. I have had a tilt steering columns in cars and trucks dating back to my 1973 Buick and in all of these vehicles I have raised the steering wheel to get out. I recently tried out a 2019 Denali and when I got in my right leg drug on the bottom of the steering wheel. I looked for the tilt lever and was disappointed by what you had to do to adjust the wheel. But, once adjusted to my liking, I found I did not have to adjust it again and I liked it. My 2014 Sierra and my 2017 Denali both had the adjustable pedals and I never found a need to adjust them as long as they were all the way down. I really liked the 2019 and it felt both quicker and smoother than my 2017. Also it was quieter and rode better. 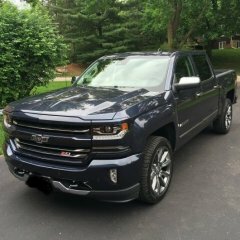 While I really like my 2017 I plan on trading as soon as GM starts to offer some incentives on the new trucks. Denali Ultimate Chrome Inserts and Brake Dust! I found that when I sprayed my tires with tire shine if I did not clean the excess over spray off the wheels that it would get hard and I had to use paint cleaner with a lot of rubbing to get them smooth again. I seemed like once it dried and maybe a little wheel heat is when the problem showed up. There was some roughness to the painted areas of the wheels too. It took a while but I got it all off.